Vandals who destroyed a children’s play area in Craigavon have been widely condemned. SDLP activist Thomas Larkham said he was ‘totally disgusted by the vandalism which has occurred at Pinebank playpark’. “Someone has decided it would be a good idea to cover pieces of equipment and the matting in the park that is used by the local community with paint- totally pointless and destructive! “I am aware of another incident at the start of the week where graffiti appeared on the fence of a house close to the park so they may be linked,” said Mr Larkham. “I have contacted council to have the play park cleaned and the paint removed urgently! Sinn Féin Representative Michael Tallon described the vandalism in Pinebank as reckless. Speaking after the incident, Mr Tallon said: “Those involved in vandalising this playpark are reckless vandals and their actions are outwardly rejected by the local community. 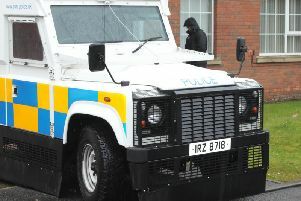 “We have reported this and would call on anyone with information to contact the PSNI.